Acknowledging the flowers potentiality in flourishing beauty inside every woman, Mamonde, the floral inspired skincare and beauty expert continues to uncover the hidden power and energizing nutrients of flowers via its latest Flower Facial Mask Line. Inspired by the distinctive properties of four selected flowers, namely the Rose, Heartleaf Houttuynia, Calendula and Evening Primrose, Mamonde's New Flower Facial Mask Line brings women's beauty back into bloom through its bouquet of floral goodness offered to the skin. A woody perennial, the Rose was first spotted in the Babylonian Kingdom in 2000 B.C., prior to being cultivated by the British and French later in the 16th century. Roses blooms in various shapes and colours, and it is usually extracted to produce rose oils or used as an ingredient in the cosmetics industry. Beautiful and healing, the Rose is loved by many for both its ornamental values and the many benefits it brings to the skin. Not only does the Rose helps calm the mind, its anti-oxidative properties also help boost and refine tired skin for a clear and healthier look. With such admitation for the Rose, Mamonde has identified three outstanding properties for the formulation of its latest Flower Mask. Introducing Mamonde's Petal Purifying Bubble Mask, a rose-derived, wash-off mask that offers excellent calming, moisturising and anti-oxidative effect to the skin. The new Petal Purifying Bubble Mask, which is infused with visible rose petals together with green tea and peppermint extracts, helps revitalise stressed skin caused by external environments, bringing dull-looking skin back to life. While green tea is well known for its anti-oxidative property, the peppermint extract in the rose mask, helps maintain adequate moisture on the skin surface. Looking for a skincare remedy to combat dull, tired looking skin? The Mamonde latest Purifying Bubble Mask is perfect for you as this floral inspired mask instantly boosts skin for a radiant look. When applied, this rose inspired mask immediately forms soft, fluffy and chiffon-like bubbles to purify and give skin a clear complexion. The Petal Purifying Bubble Mask is best for dry skin and dull & fatigue skin. After cleansing, refine the skin with toner. Put an adequate amount of the Purifying Bubble Mask on dry hands and apply all over the face except for eyes and mouth area. Once fine bubbles are formed (approximately a minute later), apply warm and massage the lather gently. Wash off thoroughly with warm water. Close both the inner and outer cap after each use to prevent contact with air. According to the recorded history, the Heartleaf Houttuynia is native to Japan as it was the first plant to be found sprouted in Hiroshima in 1945. Grown abundantly in moist, shady environment, the Heartlead Houttuynia is used widely as herbal medicine as it is rich in protein, minerals and vitamin B. On top of that, this flowering plant also possessess ample benefits to the skin. Through extensive research and careful observation of the Heartleaf Hottuynia, Mamonde has discovered the antibacterial properties of the plant that is especially suited for enlarged pores and oily-prone skin. Amazed by the plant's ability, Mamonde through its breakthrough has formulated the Pore Clean Clay Mask. This is a wash-off face mask that uses the leaves of the Heartleaf Hottyunia and walnut shells as its main ingredients. Made up of natural mineral clay infused with grounded Heartleaf Hottyunia and walnut shells, the Mamonde latest Pore Clean Clay Mask helps absorb excess sebum and at the same time exfoliate dead skin cells on the skin surface. Its gentle, mild and soft cream texture keeps the skin moisturised while helps to maintaining oil balance; the skin ultimately feels soft, smooth and supple after rinsing. It is suitable for those with enlarged pores and sensitive skin. The Pore Clean Clay Mask is best for oily skin and skin with dead skin cells. After cleansing, refine the skin texture with toner. Apply an adequate amount of the Pore Clean Clay Mask on dry face. Spread thoroughly all over the face except for the eye and mouth area. Wash off with warm water after 10-15 minutes. Dubbed as 'Pot Marigold', the Calendula flower has been used in cooking for centuries and it is very commonly found as one of the ingredients in German soups and stews. A flower belonging to the Asteraceae family, the Calendula plant is native to Southwestern Asia, Western Europe, Macaonesia and the Mediterranean. Not only Calendula is used in cooking, the flower is also well known for its multiple benefits to the skin. Therefore, it is frequently used in the formulation of soaps, creams and cosmetics products. Tapping into the benefits of the Calendula flower to the skin, Mamonde through its R&D has discovered this flower contains soothing & hydrate effect, leaving skin feeling dewy and hydrated. Inspired, Mamonde the formulates and introduces the all-new Calming Hydro Sleeping Mask. A leave-on sleeping mask, the Mamonde Calming Hydro Sleeping Mask is blended with Calendula petals alongside Centella, Aloe Vera and Cucumber extract to calm skin and lock in moisture for a hydrated look. Designed with water-gel formula, the Mamonde Calming Hydro Sleeping Mask comes with a dewy texture that gives skin a cool and refreshing feel upon application. The Calming Hydro Sleeping Mask is suitable for sensitive and dry skin. Take an adequate amount of the Calming Hydro Sleeping Mask and apply all over the face except for eyes and mouth area. Allow the water-gel texture to melt into skin completely as you spread it over the face. A species belonging to the Oenothera, the Evening Primrose is especially unique when compared to other flowering plants as it only blooms in the late evenings, producing an interesting spectacle to flower enthusiasts. The Evening Primrose has a lifespan of two years and it adapts well in harsh environments. While it is known that the Evening Primrose is rich in Gamma Lenolenic Acid (a type of fatty acid that nourishes the skin), Mamonde's R&D has unleashed the flower's excellent moisturising properties in enabling the plant to survive under harsh conditions. Inspired by the amazing features the Evening Primrose holds, Mamonde has developed and hence introduced the Enriched Nutri Sleeping Mask. Formulated in accordance with the Flower Oil Complex (a formula that combines three types of flower oils, i.e. Evening Primrose Oil, Camellia Oil & Sunflower Oil), the Mamonde Enriched Nutri Sleeping Mask, which is also infused with moisturising ingredients extracted from the Evening Primrose, glides gently and provides dewiness to the skin once applied. 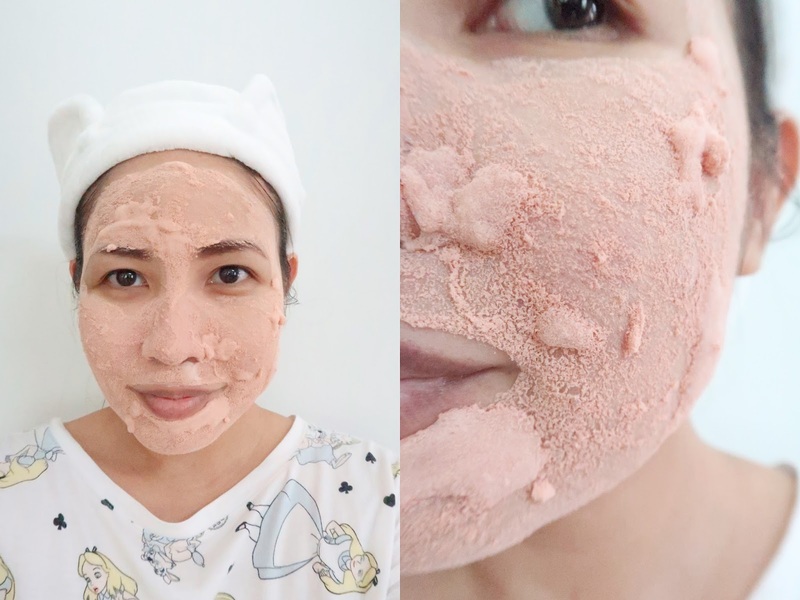 In addition, this leave-on mask contains nutrient capsules to help fortify the protective layer of the skin, thus lowering the chances of external pollutants from harming the skin. Upon application, skin feels nourished and moisturized without feeling sticky. The Enriched Nutri Sleeping Mask is suitable for bloated and dehydrated skin. Take an adequate amount of the Enriched Nutri Sleeping Mask and apply all over the face except for eyes and mouth area. Allow the mask to absorb into the skin. The Mamonde Enriched Nutri Sleeping Mask is especially catered to those with bloated and dehydrated skin.